I have recently returned from my 10th or possibly 12th trip to Iceland, a location that undoubtedly ranks as one of the worlds great cold water angling destinations. I have fished in Iceland extensively over the past 20 years, and prior to this most recent trip I would have said that the fishing here is more about catching quantity rather than quality, with boat loads of small to medium sized cod, haddock and coalfish comprising the majority of most days fishing; how very wrong I was. My first fish caught at Sudavik, a 30lb plus coalfish. 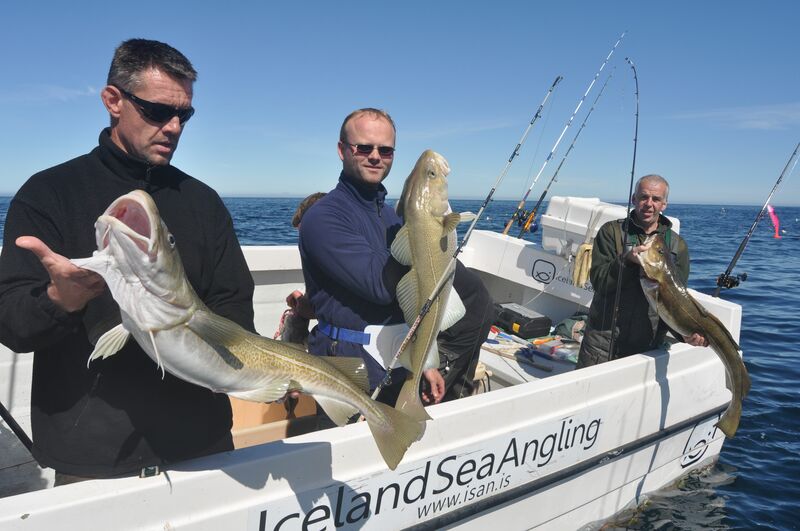 My trip had been arranged by ‘Iceland Sea Angling’ and began with a couple of days based at Sudavik in the far north-west of the country, a short 15 minute drive from the airport at Isafjordur. Guests stay in well equipped apartments and houses a short walk from the harbour, fishing aboard self-drive boats. A small pub and restaurant, and a well stocked shop are close by, and all necessary items of tackle can be bought on site. Rods and reels are available for hire, as are good quality flotation suits. 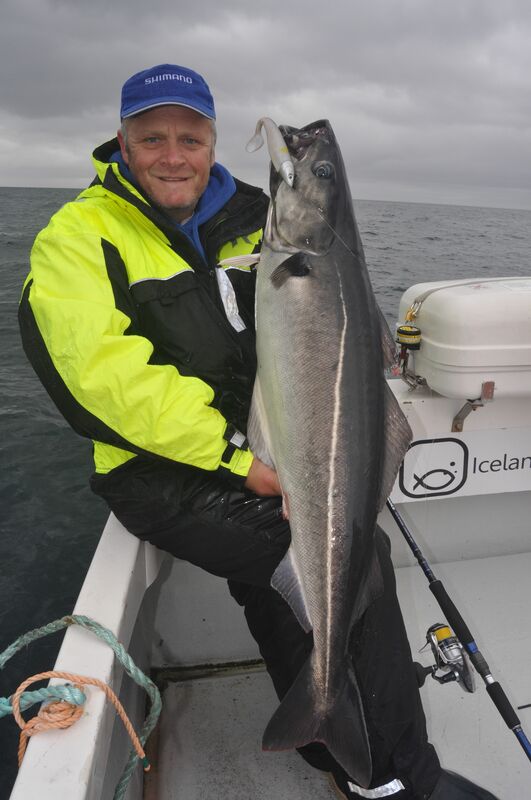 Without a doubt the boats provided by Iceland Sea Angling are the most sea worthy, comfortable and well equipped self-drive boats I have fished aboard anywhere in the world, and I have fished aboard a lot of self-drive boats. Powered by 130hp Volvo Penta stern drive’s, the boats will fish four anglers in absolute comfort and safety, even as many as five or six. Each boat is provided with an automatically inflating life raft, 25 watt VHF-DSC radio with built in distress calling facility, A.I.S (Automatic Identification. System) tracking, a quality Garmin fish finder/chart plotter, and everything else you need for a safe day afloat. 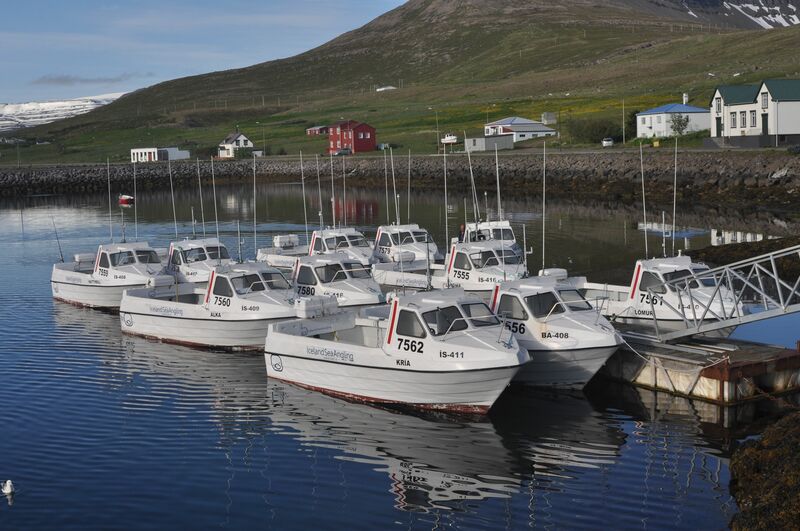 The excellent self-drive boats as supplied by Iceland Sea Angling. Further, the company insist that each time you set sail you book out with the local coast guard, confirming the boat number, how many persons on board, and that you then contact them again on your return to harbour. Top speed was around 18-19knots, with an ideal cruising speed of around 15 knots. On our first session afloat we were joined by Henri Karier, the camps excellent head guide, who took us to a spot inside of the fjord just twenty minutes run from harbour. Here Henri and my friend Terry Thomas fished a selection of pirks and large shads in the usual style in 120m of water, while I rigged a 120g Storm Ultra Shad on a four-piece Shimano Blue Romance travel spinning rod matched with a Shimano Saragossa 5000 fixed spool loaded with 20lbBS PowerPro. 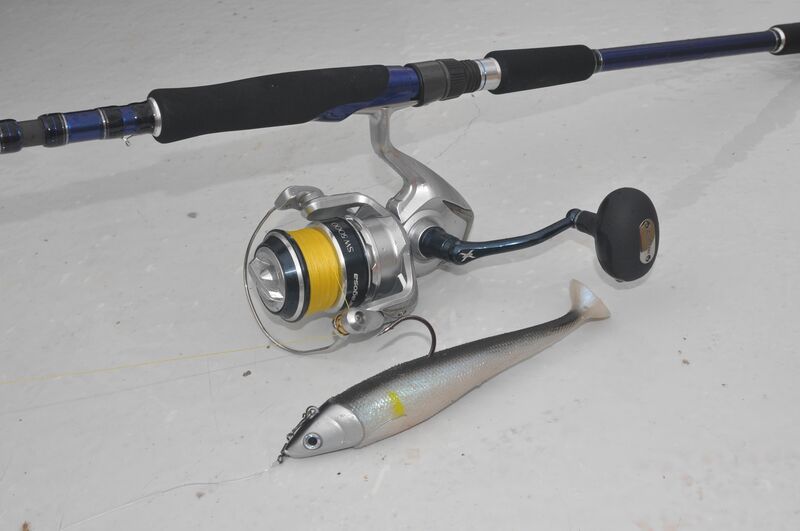 My Shimano Saragosa 5000 and 120g Storm Ultra Shad lure. In no time at all lures fished near the bottom were catching decent cod weighing well into double figures, while my Storm Ultra Shad was almost immediately nailed by a fast running, deep diving fish that I quickly guessed was a decent coalfish. That first coalie weighed over 30lb and was one of five 30lb+ coalfish I caught in just two hours fishing, the best a new personal best that went 35lb 4oz. Henri soon switched to similar tactics to me and also caught some very big coalfish. A move inshore to fish bait on the drift over rough ground very quickly produced big wolffish, frozen squid are available at the camp. A brace of 35lb+ coalfish for myself & Henri Karier. We fished at Sudavik for three days, with our boat and most others based at the camp catching impressive numbers of quality fish each day, notably big coalfish that were averaging well over 20lb, along with many over 30lb. Cod to over 30lb, lots of big wolffish, haddock and redfish were also caught. I had taken a few packets of frozen worms with me, and these very quickly produced nice dabs from the boat. Fishing from the harbour pontoons also produced lots of big dabs. 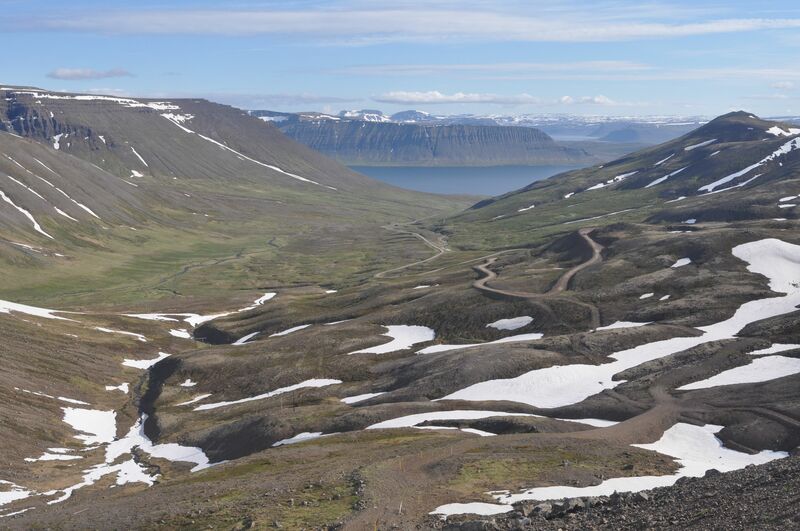 Halfway through the trip we set off on the three hour drive across the mountains to our second camp at Talknafjordur. It’s a beautiful drive during which you get to see some truly breathtaking scenery. The accommodation at Talknafjordur is 5*, guests staying in new and superbly equipped wooden chalets overlooking the fjord, perfect for families. Once again a restaurant and shop are close by, and the harbour is a two minute drive away, where guests fish from identical boats to Sudavik. A big wolffish for Terry Thomas, one of many caught every time we targeted them. Beautiful Icelandic scenery on the drive to Talknafjordur. On our first days fishing we were joined by Kai Biala, the camp head guide, who took us to fish a patch of ground lying in 80-90m of water two hours run out to the west. 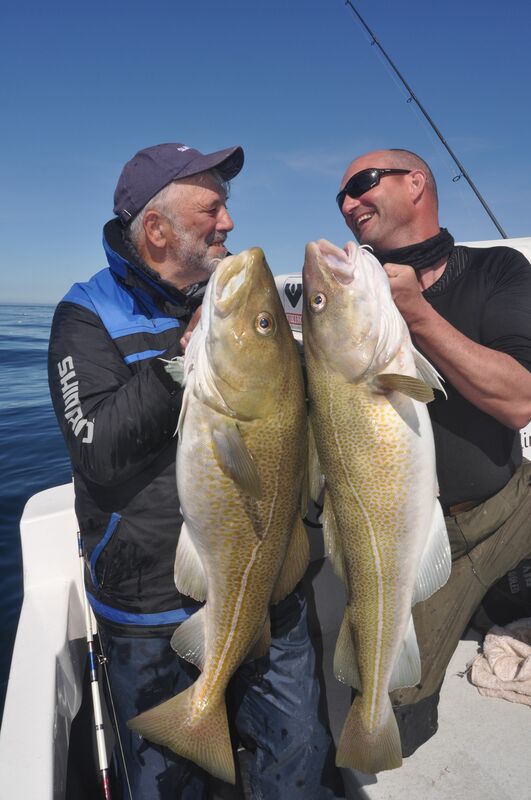 Within seconds of our lures getting anywhere near the bottom they were taken by cod; invariably big cod averaging well over 10lb, with many better than 20lb and several weighing well over 30lb. 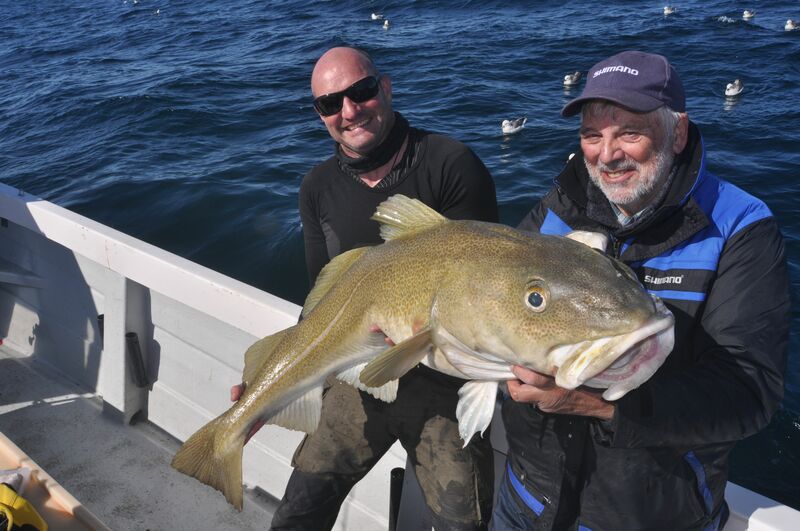 Terry caught the biggest cod which weighed just over 38lb, but 50lb plus fish had been caught just the day before, and the camp record stands at over 70lb. I honestly don’t know how many cod we caught that day, but the number was considerable. The boats fish four anglers in absolute comfort, and as many as five or six. As soon as Kai, who is another truly excellent guide, revealed that the tide was right for coalfish I switched to my Storm Ultra Shad/Shimano spin outfit that had been so successful at Sudavik, and once again I was very quickly tight to a big coalfish. We boated several over 30lb, outstanding fish for sure, but Kai tempered our elation by saying the camp coalfish record is held with one that weighed 50lb, equalling the world record! 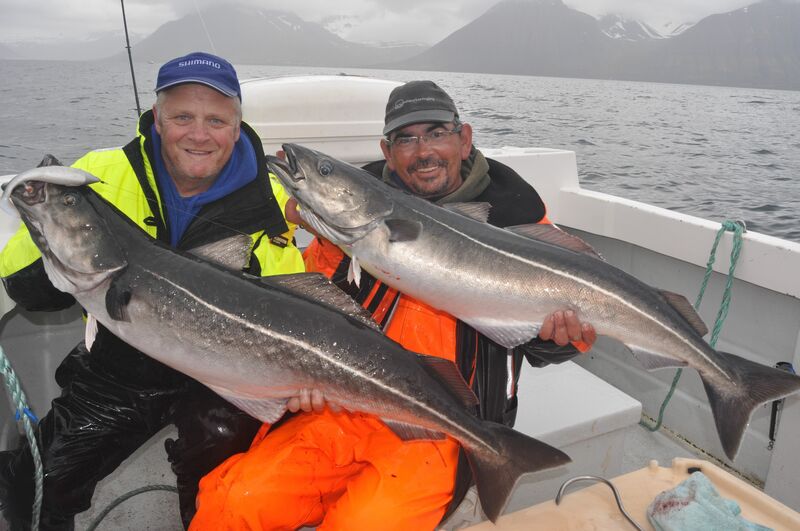 As I have explained I have fished many times in Iceland, and these in addition to more than 30 trips to Norway, along with numerous others to Denmark, Sweden and The Faroe Islands, but never have I seen such consistent fishing for trophy coalfish. A 38lb plus cod for Terry Thomas. Kai Biala holds one of many big, shad caught cod. 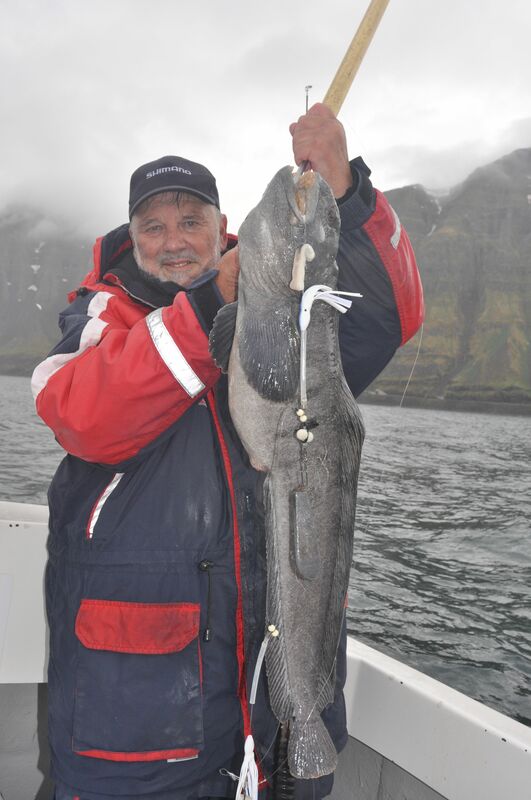 The cod fish off Icelands north-west fjords is outstanding. 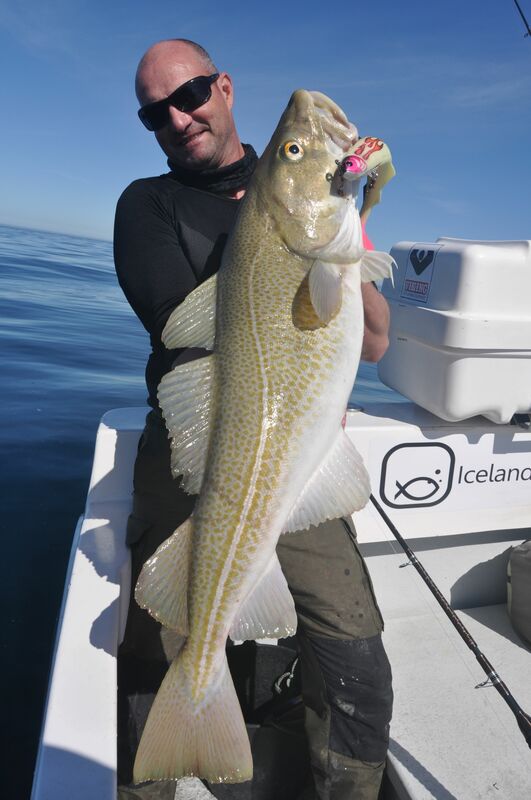 The cod fishing I found in north-west Iceland is the equal of all but the very best days I have experienced in Norway, and I am reliably told by other anglers we met in Iceland, some of whom were on their forth or fifth trips with Iceland Sea Angling, that it can be much, much better. 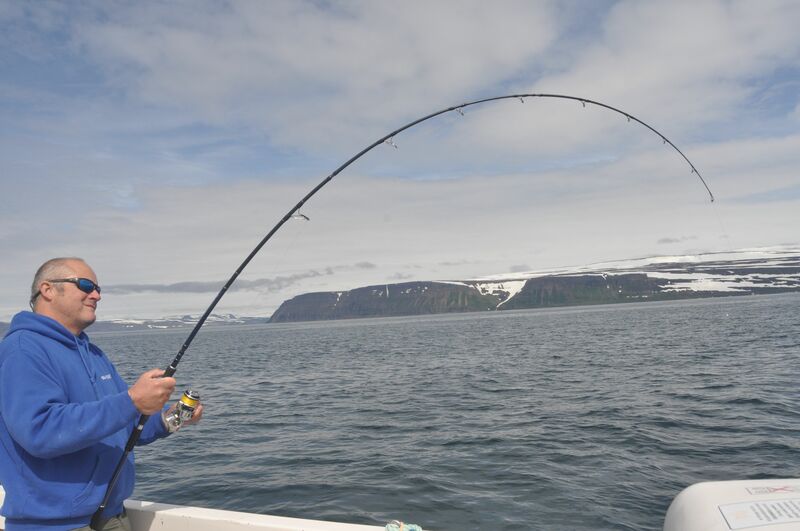 Considering the extremely high quality of the self drive boats and Iceland’s easy accessibility from the UK, I honestly feel that the north west Fjords are a strong contender for the title of Europe’s ultimate sea angling destination. Certainly this is a destination any serious sea angler must add to his bucket list. Of course I am going back, already we have reserved a week at the same time of year in summer 2016. If you are keen to join us on this trip or book a private trip then you should contact Anglers World Holidays on Tel: 01246 221717. This trip is perfect for individual anglers and small groups alike. 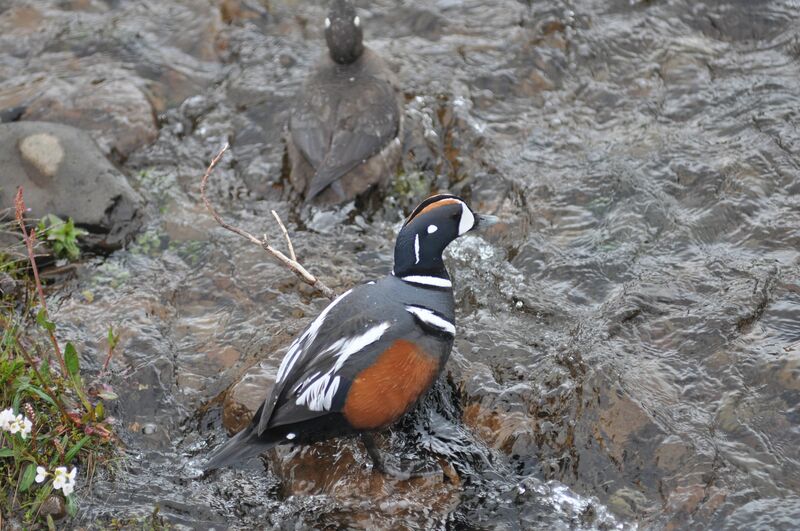 A colourful Icelandic harlequin duck.